Jibhi is the most beautiful and tempting destination in Himachal Pradesh (North India). Every year it tempts thousands of tourists who wish either to spend their leisure holidays or on honeymoon trips. The snow capped peaks of himalyas are just breath taking. The Beas river adds the beauty of Manali by jewelling the hills with its smooth flow. The white snow capped hills and the River Beas over them looks wonderful and starring. Jibhi Banjar and Manali are the excellent place for family holidays, school trips, corporate trips and even a good honeymoon destination. 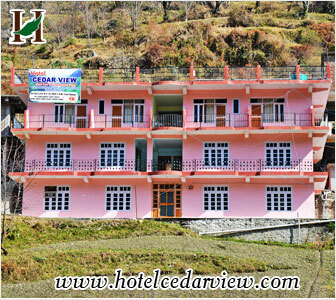 The Hotel Cedar View is situated in the charming Jibhi Village which is just 07 Kilometres from Banjar Bus Stand and is surrounded by vast expanse of the apple orchards and offers wonderfully fresh, clean air. The magic of the Hotel is in its serene location, luxurious amenities and warm hospitality. Indulge in the discovery of the mystic beauty of the Himalayas; where the bright golden light of the sun scatters over snow covered mountains in the morning, the sounds of the river Beas gushing downstream and chirping birds calms you during the day, and the bright light of the moon reflects off the white snow at night. You can relax in this elegant luxury mountainside hotel named hotel cedar view offering 20 rooms and suites that bask in the daytime sunshine creating a warm and welcoming retreat. The tasteful accommodation has local design touches with rich colours, wooden floors and plush furnishings along with modern amenities and optional stunning views. The Hotel facilities allow guests to dine in style and take your Meal with the Breathtaking View Of Himalyas. In Jibhi village there are many attractive highlighted place for tourists like Chaini Fort, Transcript at Chaini Fort, Unripe Apple near Chaini Village, Sarehul Lake and Temple, Sarehul Lake and Temple, Himalayan Trout Fish, Old Architecture near the Chaini Fort, The trek through Jalori Pass, Sarehul Lake, Sarehul Lake Temple, Waterfalls, Watermill Grinding Wheat, Snowfall, Scarce flowers and the scene of mountains. In Jibhi Village tourist can plan to do many adventurous activities like Cycling, Trekking, Skiing, Camping, River Crossing, Rock Climbing, Motor Biking, River Rafting and many more. We suggest you to visit Jibhi's Hotel Cedar View and spend your enjoyful vacations and see the beauties of nature. For Bookings please contact us.